The US Federal Open Market Committee (FOMC) delivered one more rate hike for 2018, at its last policy meeting on Wednesday, while taking a softer approach on its forward guidance amid rising uncertainly on economic growth expectations that could hinder price developments. This rate increase marks the ninth hike by the Federal Reserve Bank (Fed) since December 2015, taking its policy rate from the range of zero per cent to 0.25 per cent, the lowest it has been since the 1960s, up to the range of 2.25 per cent to 2.5 per cent. The strong economic data in the US has underpinned the Fed’s position to reverse monetary conditions in the US by raising interest rates, initiating the partial and gradual reversion of its quantitative easing (QE) programme and maintaining a strong guidance on future expected rate hikes. Even now, data in the US continues to display signs of strong economic conditions. Annualised GDP growth in the third quarter was of 3.5 per cent, giving an average growth rate of 3.3 per cent over the first three quarters of the year. Labour market conditions remain very strong, with unemployment rate at 3.7 per cent lying below pre-2008 crisis levels, and with positive job growth seen on a monthly basis. Consumer spend­ing continued to grow at a relatively constant pace while business investment rose at a moderate rate. However, following a string of hawkish communications from the FOMC on the normalisation of monetary conditions in the US, indicating also the possibility of raising interest rates above its long-run estimate, we are seeing a potential step back in the expected interest rate hike cycle indicated by the Fed. 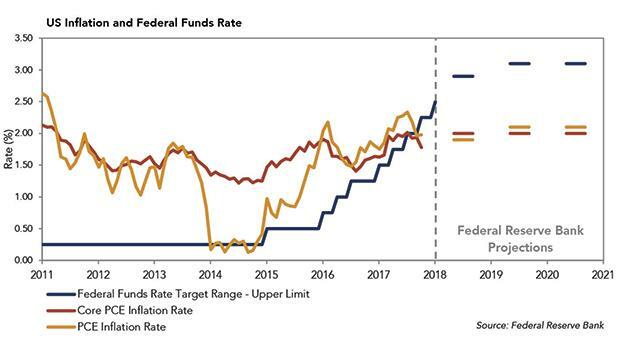 The appropriate policy path projected by the Fed has been revised down to two rate hikes in 2019 from the three rate hikes projected in September. The change in forward guidance came also with downward revisions in GDP growth and inflation rates projected by the Fed for year 2019. This moderation in tone is coming at a time when the Fed is being pressured by President Donald Trump to maintain interest rates low and when the economic growth outlook is clouded by uncertainty on the political landscape particularly due to the unpredictable outcome of the trade tariff discussions. The US Treasury market is also signalling a potential economic slowdown, with safe haven buying resulting in a flattening movement in the yield curve, driving the differential between two-year and 10-year treasury yields to just below 10 basis points (or 0.10 per cent). The US stock market has fallen by about 14 per cent since October, as measured by the S&P 500 Index, reflecting expectations of a more challenging environment for corporate profitability. The reassessment of the corporate earnings outlook and the correction in equity valuations is two-pronged. Firstly, the general level of earnings growth is expected to be lower in 2019, reflecting both an expected deceleration in demand as well as inflationary factors driving up costs. Secondly, the increased un­predictability surrounding corporate earnings expectations has increased the market risk premia, resulting in higher discount rates required by investors. While the possibility of a slowdown is increasing, it seems unlikely that this will translate into an economic recession. While economic fundamentals remain strong, market interest rates show an implied probability of less than 50 per cent for just one rate hike in 2019. This means that the market expects the Fed to moderate its forward guidance even further and slow down, possibly even halt, the pace of rate increases. This may provide some capacity for expectations to strengthen while things become clearer on the political front. Matthias Busuttil is senior portfolio and investment manager at Curmi and Partners Ltd. The information presented in this commentary is solely provided for informational purposes and is not to be interpreted as investment advice, or to be used or considered as an offer or a solicitation to sell/buy or subscribe for any financial instruments, nor to constitute any advice or recommendation with respect to such financial instruments. Curmi and Partners Ltd is a me­mber of the Malta Stock Ex­change and is licensed by the MFSA to conduct investment services business.